Yi-Jian Wu, Founder & CEO of Yuanqu Tech in China, talks about how NVIDIA Tesla GPUs are being used to train their interactive educational robot for children. 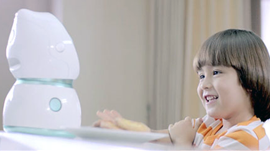 Call the robot’s name and the speech-controlled robot is able to tell jokes, answer educational questions, teach English and act as a patient tutor for a child. For more information visit http://www.yuanqutech.com.